NMM 7334. 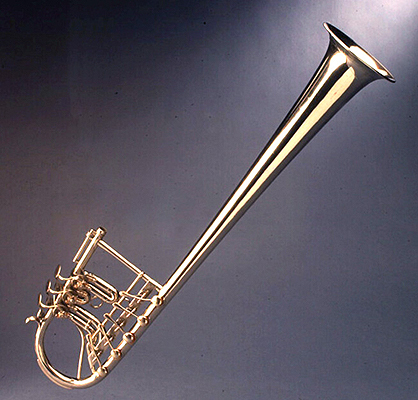 Over-the-shoulder cornet in E-flat by Elbridge G. Wright, Boston, ca. 1850. Joe R. and Joella F. Utley Collection of Brass Instruments, 1999. 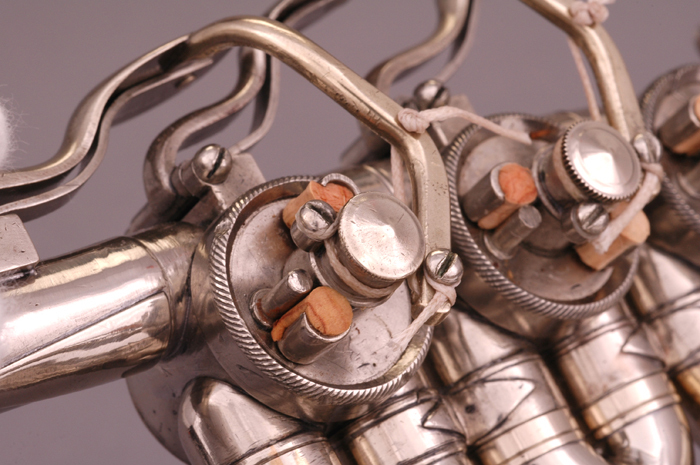 This instrument is one of only two surviving over-the-shoulder cornets featuring three valves and five keys made by E. G. Wright. According to Allen Dodworth's Brass Band School (New York: 1853), such instruments combined "the fullness of tone in the lower notes peculiar to valve instruments with the greater ease and facility of the upper notes which is peculiar to keyed instruments." 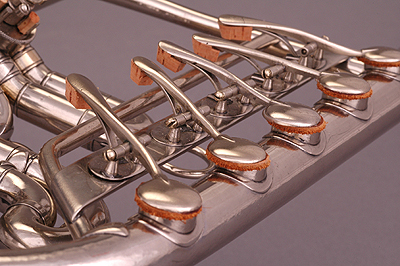 Cornets with valves and keys were truly transitional instruments, combining the best elements of older brass instrument design--keys--with the latest development in brass technology--valves. 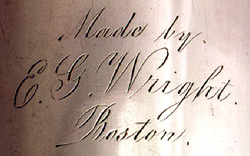 Signature engraved on bell: Made by / E. G. Wright. / Boston. Body: German-silver body: leadpipe with telescopic tuning slide, valve cluster, and bellpipe (bell and bell bow in one integral part). Overlapping tab seam extending over the entire length of the bellpipe (sloping tabs 5 mm wide and 5 mm apart). Undecorated garland; Saxon rim. Ferrules with one engraved line adjacent to the edge; receiver ferrule with bead-pattern. Bell to the left of the leadpipe. Valve detail showing pin stop and three-point wing device with cork-buffers; left valve in on position, right valve in off position. Valves: Three top-action, string-operated, rotary valves. Leaf-spring return mechanism; pin stop and three-point-wing device with cork-buffers on pulley. Internal slide tubing. Windway: first, second, third valve. Keys: Five closed keys operated by the left hand serve the notes a-flat2, a2, b-flat2, b2 and c3 (relative to c-pitch). Round, spoon-shaped key heads with renewed brown leather pads; German-silver tone-hole rims with undecorated tone-hole borders. Keys pivot on pin in pillars on oval footplate; leaf-springs guided in channels on footplates. Sounding length (including inserted tuning slide): 922 mm; internal diameter, leadpipe: 10.9 mm; internal diameter, telescoping tuning slide: 10.3 mm; bore diameter (inner valve slides): 11 mm; bell diameter: 114 mm. Literature: Sabine K. Klaus, "Over-the-shoulder Cornet by E. G. Wright," in "Historic Instrument Window," Sabine K. Klaus, editor, International Trumpet Guild Journal, Vol. 30, No. 4 (June 2006), p. 41.